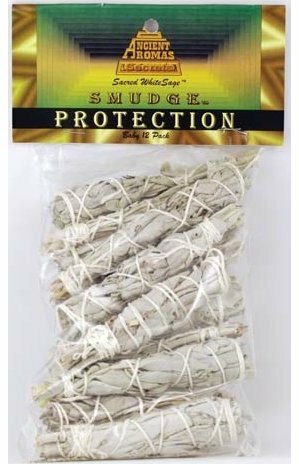 Shop > Ritual Supplies > Smudge Sticks > White Sage Smudge Stick 12pk 3 1/2"
White Sage corresponds with the element of Air, the planet Jupiter, and is one of the most utilized herbs in cleansing and purification rituals. Dispersing negative energy and vibrations this herb aids in healing by creating a lighter environment. Science has even discovered that burning White Sage may reduce the presence of certain bacteria in the air. It may also aid in the manifestation of protection and prosperity. This is a package of 12 smudging sticks or wands approximately 3 and 1/2 inches in length. Light at one end allowing the smoke to permeate the space and objects within. Once burnt past the last wrap place loose sage in a fire safe container, such as an abalone shell, and continue to allow the sage to smolder.